It’s Summer – Let’s Get Camping! Now that we’re at the heart of summer, everyone is gearing up for some great camping adventures – myself included. After you have your campsite reserved and paid for, all you have to do is get ready. OK—let’s handle this camping-prep problem. To discuss each of these key areas, I will use Pinnacles National Park as my destination location example. Before you can even consider packing, you need to know what you’re getting into in terms of weather. Different environmental conditions will result in different packing requirements, so make sure you know what to expect. If your camping trip is planned a few months in advance, you can review typical weather patterns from previous years. Many locations list this information on their websites. If you are camping within the next week or so, you can review weather forecasts online. According to the National Weather Service, Pinnacles National Park will experience weather in the high upper 90s with lows in the 50s over the next 10 days. According to The Weather Channel, Pinnacles National Park will experience weather in the mid-upper 80s with lows in the upper 50s and low 60s during that same time frame. Granted, there is only about a 10-20 degree spread difference here, but low-mid 80s versus almost 100° = MAJOR DIFFERENCE!!! If weather is supposed to be a science, why are there so many different findings??? So, with summer camping, at least, dressing in layers is probably your best bet. From these and other forecasts, I can AT LEAST determine that the weather will be warm, if not ungodly hot, so I know you can/should pack the swimming equipment, shorts, and tank tops. The first rule of packing is always have a checklist. Most of these pre-made lists have options for different weather conditions, and some sites include additional lists for camping in certain regions or terrain. You should also check your camping destination’s website, since their site may also list additional packing recommendations. Once you have your list and a more extensive pre-made list, it’s time to blend them together. You can blend lists with any documentation-maker program. I recommend starting with copying and pasting the pre-made camping list into a document file. With your personal list in hand, check it against the pre-made list. Add-in items not already included on the list. Also, eliminate list items that do not pertain to your camping needs. To make sure you do forget anything, double-check your personal list against this new master list you’ve just created. After you are sure the list is as complete as possible, you can either print the list with multiple pages or format the list to fit on one page. Not all lists will fit onto one page, but if you adjust the margins to about 0.5”-0.6”, reduce the font size to 10, and create at least three columns, you should be able to fit everything onto one single page. I prefer using one-page lists, because additional pages can get overlooked or lost, which means that items on those pages may not get packed. Realize that the pre-made packing lists are both general and obsessive. To accommodate camping groups of all sizes and skill levels, the lists have to be general. However, since these lists are usually designed for novice campers, they obsessively include many items that are not necessary for most camping trips. Although most pre-made lists tell you to pack food and water, they are not very specific about what types of food to bring. You’ll have to determine what meals you are going to make to draft a packing checklist for food. Suggestions for camp food will be discussed later. Upon successfully assembling your packing list, you’ll need to start gathering up all your items. If at all possible, DO NOT WAIT UNTIL THE LAST MINUTE!!! 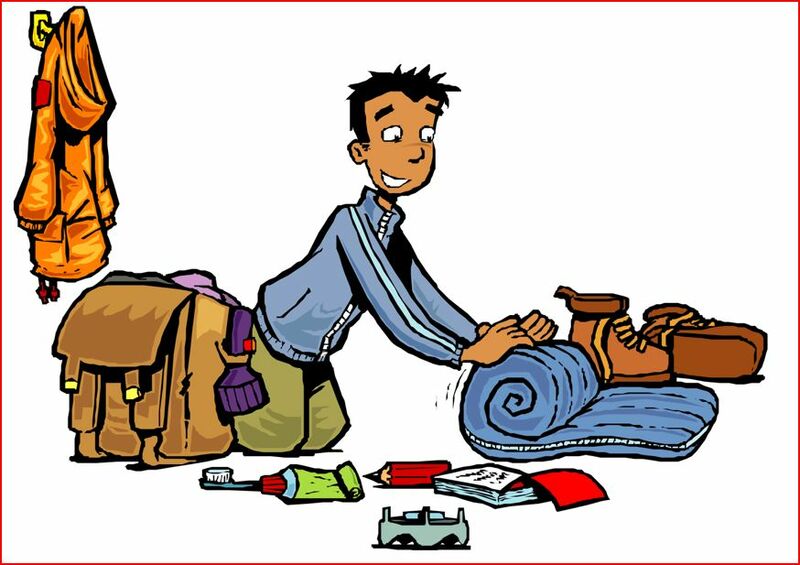 Give yourself a few days before the camping trip begins to go through all your equipment and start pre-packing. Why should you go through your equipment ahead of time? To determine what you have and what you need to buy. To verify if all your equipment works. To figure out how much stuff you will have to fit in your car. As you start pulling items out and putting them in a central location, keep a pad of paper handy to start making notes on what you will need to purchase before your trip. To minimize multiple shopping trips, go through all of your equipment first and keep an ongoing to-buy list. Remember that as you are preparing everything, consider all the stuff you still need to buy and how much space those items will take up in addition to what you already have. 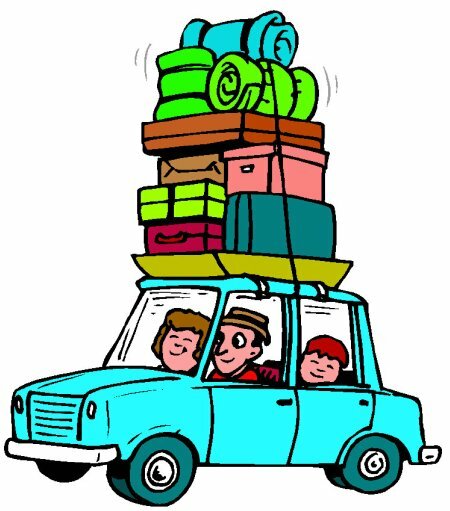 Your vehicle may not be big enough to pack up all your stuff and your passengers. You might want to borrow or rent a different vehicle to make packing and travel more comfortable. If you’re going camping by yourself or with your partner, you can be a little more relaxed with activity planning. If you’re going with a lot of people and children, on the other hand, you’re going to need to know what’s available to keep everyone entertained. First stop – your camping destination’s website. When you are looking for activities, don’t forget to print out or grab some maps. You want to be able to find everything your fellow campers want to do. Many websites have a “things to do” tab. Typical adventures at most camping destinations include hiking, swimming, rock climbing, fishing, and boating. At Pinnacles, though, there are some unique activities to check out. Depending on the time of year, Pinnacles’ campers can explore Bear Gulch Cave and Balconies Cave. These caves are protected habitats of the Townsend Big-Ear Bats, so parts of the caves may be closed off to the public in order to keep the bats safe. Since most camping locations are away from all the light pollution of the big cities, many campgrounds host night hikes. Visitors can gaze at the stars and often get a mini-astronomy lesson from hike leaders. Night hikes are usually limited to a certain number of guests, so you should reserve your spot as far ahead of time as possible. Many camping destinations are conservations for various species of birds. At Pinnacles, visitors can actually see the endangered California Condor. If you or your camping companions are really into birding (a.k.a., bird watching), you can print out this checklist to see who can identify the most bird species at the park. 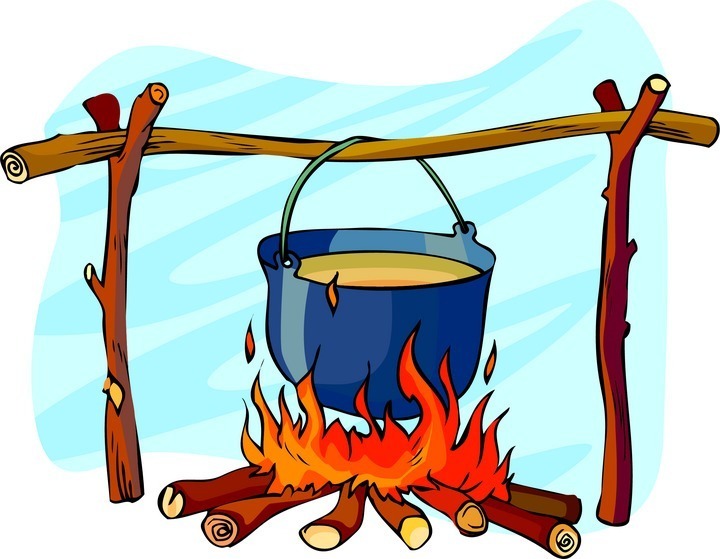 Although the adjacent clipart may imply cooking over an open fire, not all campgrounds allow fires year-round. According to Pinnacles’ website, for example, there is an extreme weather warning going on, so there are no fires allowed in the park. If you can’t cook over a fire, how are you supposed to cook your meals? Answer: gas powered grill or stove. Nowadays, gas powered grills come in all shapes and sizes. The size of your grill will determine the amount of food you can prepare at any one time. For example, if your grill has two burners, you can only cook two pots worth of food at once, assuming both pots/pans fit on the grill at the same time. Cooking with a gas powered grill can be difficult and time-consuming, but there are a few shortcuts you should consider to make mealtimes less stressful. If you pre-plan your meals, you will know exactly what ingredients to take to make each meal. Therefore, try to package individual meal ingredients together and label those meal packets. If you keep everything together for each individual meal, you won’t find yourself constantly looking for ingredients that someone may have moved or packed elsewhere. If you can get away with it, cook your meals beforehand and only use your gas grill to heat stuff up. By cooking ahead of time, you can have meals ready in less than 15 minutes. For breakfast and lunch, there are many no-cook options. There are even some delicious no-cook ideas for dinners. Just make your no-cook options easily accessible so that people can assemble their meals on their own. Before you leave for your trip, let key people know where you are going and how to reach you in case of an emergency. Arrange to have someone look after your pets, plants, and mail. If no one will be in your house while you are away, save money and energy by turning off your air conditioner as well as all your lights and appliances. Although you may be really excited about your trip and want to announce your itinerary on social media websites, security experts advise against it. According to these experts, criminals could figure out where you live based on your posts. Personally, I find this last bit of advice a little paranoid, even for me. Yes – if you don’t have your privacy settings set, strangers could look at your Facebook profile and figure out where you live based on your posts, your pictures, and any GPS data included on your profile. However, what are the chances that a random criminal will happen to pick your Facebook page to determine if you are going to be away from home? I think the only real possibility is that someone on your “friends” list could see that you’ll be away from home, and then that so-called friend might decide to take advantage of the opportunity and break into your house. Close all the window shades. Make sure your valuables are in a secure, hidden location. Let the right people know how long you will be gone. After the home front has been secured, the car packed, and the itinerary planned out, it’s time to get in the car and have your summer camping adventure!